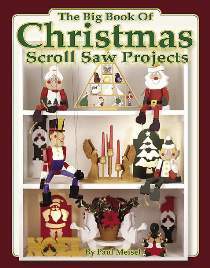 You’ll enjoy this wide variety of classic Meisel Christmas projects. There are plans for several candle holders, a nutcracker, a poinsettia plant display stand, a door wreath, sidewalk luminaries, holiday puzzle wall hangings, a Twelve Days of Christmas shadowbox, a silhouette balancer, a marionette, holiday shoelace climbers, Santa table centerpiece, a nativity scene, a peace dove overboard, holiday flower pot people, and many others. Includes FULL SIZE plans for over 40 projects in all! (Many of these project plans are ONLY available in the book.) Beautiful color photographs. 160 pages.